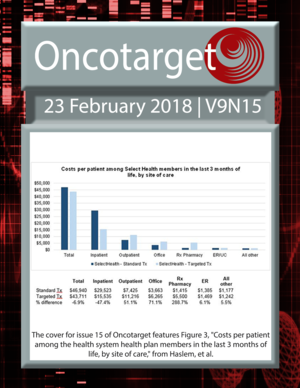 The cover for issue 15 of Oncotarget features Figure 3, "Costs per patient among the health system health plan members in the last 3 months of life, by site of care," from Haslem, et al. 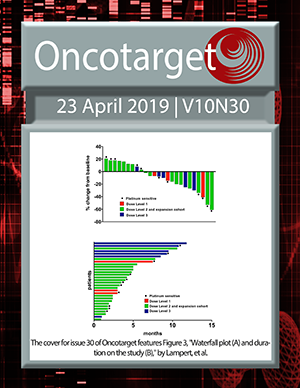 Who will benefit more from maintenance therapy of metastatic colorectal cancer? Could ALDH2*2 be the reason for low incidence and mortality of ovarian cancer for East Asia women? Pancreatic adenocarcinoma, chronic pancreatitis, and MODY-8 diabetes: is bile salt-dependent lipase (or carboxyl ester lipase) at the crossroads of pancreatic pathologies?